Oh, hello there. It’s been a while. Actually it’s been over a year. I’ve had a lot going on, and far too many exciting things to list in a blog post without boring you. Let’s just say that I finally started having adventures with people important to my life and that meant leaving the blog behind for a while. Jorge is pretty convinced that I should give the blog a makeover and combine my two loves, food and movies, together in a blog. So, I may see what I can do with that, provide you guys with recipes for foods that are inspired by my favorite movies. Does that sound good to anyone? For now, here’s a simple salad that I am in love with. It’s simple to make and tastes delicious. It also makes you feel good about what is going in your body. So it’s a win, win for everyone. 1. Pre-heat the oven according to the directions on the bacon package you chose. 2. While your bacon is cooking in the oven, half all of the cherry tomatoes. Cut the avocado into cubes. 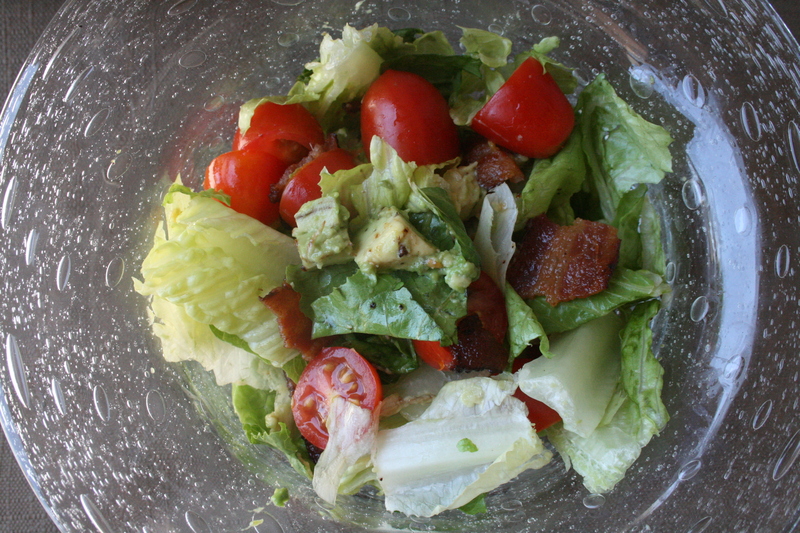 Place the tomatoes, avocado, and lettuce in a bowl. 3. Let the bacon cool before cutting it into inch long pieces. Add to the bowl of veggies. Toss the salad ingredients until everything is distributed evenly. 4. Here comes the difficult part. If you aren’t eating the salad right away, don’t add dressing. If you leave it too long, it’ll make everything soggy. Add 1 to 2 tablespoons of dressing per serving. I like to do it once I’ve distributed salad so that it’s totally coated. Sorry this was so simple for my overdue return, but I’ve been eating this a lot lately so I wanted to share it with you. A very special thank you to all my new followers who urged me to put out something new!